The Supreme Court on Wednesday noted that a CBI report placed before it reflected "some progress" in the overseas probe by the agency into the controversial Aircel-Maxis deal involving former telecom minister Dayanidhi Maran, but that there are "some difficulties". The deal also involved Kuala Lumpur-based business tycoon T Ananda Krishnan. The NGO, Centre for Public Interest Litigation and Janata Party President Subramanian Swamy, had filed applications in the apex court alleging that Foreign Investment Promotion Board (FIPB) approval to the Aircel-Maxis deal was granted fraudulently. "Investigation with reference to subject matter of your application has made some progress, but there are some difficulties," a bench comprising justices G S Singhvi and K S Radhakrishnan told Swamy. The remarks were made by the bench, which perused the February 21 status report filed by the CBI regarding its probe, which also included the overseas investigation. Senior advocate K K Venugopal, appearing for the CBI, had placed before the bench in a sealed cover the progress reports of the probe by the CBI and Enforcement Directorate. The bench in its order noted that the CBI report also dealt with its probe into the alleged violation by FIPB in the Aircel-Maxis deal. Venugopal told the bench that a CBI team had met with the Attorney General of Malaysia on March 21 and there was a detailed discussion based on the letters rogatory (LRs) sent to Kuala Lumpur. He said mutual assistance treaty was signed with Malaysia after the LRs were sent and it was not clear whether they would go by the old or new regime. However, he said Malaysian authorities are going through the materials on the issue to ascertain whether there was any element of criminality involved in the deal or not. At this, the bench wanted to know what would be the situation if the Malaysian authority declined assistance in the probe. Venugopal also told the bench that CBI report contains its overseas probe in Mauritius, Island of Bermuda, United Kingdom and Northern Ireland. The bench said it will take up the issue in July and till then CBI should try to complete the probe. Swamy told the court that "we can wait for sometime as CBI is looking into the materials" in connection with the FIPB clearance granted to the Aircel-Maxis deal. The court on Wednesday modified its order on the placing of progress report into the probe by saying that the agencies instead of first placing it to the CVC for its comment will table them to the apex court directly. The copies could be sent to the CVC which will give its comment and place before the apex court within two weeks. The CBI had on March 18 told the court that it has completed the domestic investigations into the deal. Earlier on November 7 last, the agency had said the overseas probe was being delayed due to the influence of the firm's owner in Malaysia who is "powerful politically". 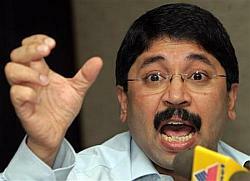 Maran has been accused of "forcing" Chennai-based telecom promoter C Sivasankaran to sell the stake in Aircel to a Malaysian firm Maxis Group in 2006 owned by Ananda Krishnan. The agency had submitted that overseas probe was important to track the money trail as the funds for the deal had come through Mauritius. The agency in July 2011 had placed a status report in the court stating that during 2004-07 when Maran was telecom Minister, Sivasankaran was coerced to sell the stake in Aircel to Maxis Group. The report, part of which was read, had said the Malaysian firm was favoured by Maran and was granted licence within six months after taking over Aircel in December 2006. Maran was the Telecom Minister between February 2004 and May, 2007. CPIL had alleged that Maran during his tenure as Telecom Minister granted 14 licences to Aircel which invested Rs 599.01 crore (Rs 5.99 billion) in his family-owned business. Later, he allegedly delayed the award of UAS licenses to Aircel, which had been applying to the DoT since 2004, by raising irrelevant issues from time to time and ignoring its owner's request to resolve them following which Sivasankaran sold the company to Maxis group. Sivasankaran had appeared before the CBI and had recorded his statement. The NGO claimed that after Aircel was taken over by Maxis, Maran’s family-owned business, Sun TV, received substantial investment from Maxis Group (Aircel) by taking 20 percent equity in Sun Direct. "Feeling harassed, Sivasankaran was forced into selling Aircel. In March 2006, Maxis bought 74 per cent stake in Aircel. The company got the FIPB approval in May 2006. As on March 3, 2006, a total of 14 applications from Aircel were pending in the DoT for award of licenses," the NGO had said.